In a remarkable turnaround, the head of the Knights of Malta resigned after publicly defying Pope Francis over the ouster of a top official involved in a condom scandal, the ancient lay Catholic order said Wednesday. Matthew Festing, 67, decided to resign after meeting with the pope on Tuesday, the order's spokeswoman Marianna Balfour told The Associated Press. "I can confirm this," Balfour said in an email, adding a statement would be forthcoming. Festing had refused to cooperate with a papal commission investigating his ouster of the order's grand chancellor, Albrecht von Boeselager, over revelations that the Knights' charity branch had distributed condoms under his watch. Festing had cited the Knights' status as a sovereign entity in refusing to cooperate with what he said was an act of internal governance. The remarkable showdown though was fraught from the start given Festing took a promise of obedience to the pope as a top-level knight, and regardless was the leader of a prominent Catholic order who was entering into a public fray with the leader of the Catholic Church. The spat unfolded against the backdrop of Francis' increasing clashes with more conservative elements in the church, especially those for whom sexual ethics and doctrinal orthodoxy are paramount. The dispute had once again pit Francis against Cardinal Raymond Burke, a leading conservative and Francis critic who also happens to be the pope's envoy to the order. Burke had been by Festing's side on Dec. 6 when Festing first asked, then demanded Boeselager's resignation. Boeselager refused, and was ousted two days later under a disciplinary procedure he contends violated the order's own rules. Festing's resignation, some nine years into a life term, appears to set the stage for the Knights' to convene an assembly to elect a new leader. Many of the orders members had lamented how the confrontation with the Holy See had drawn unwanted negative attention to the order, which relies on donations to fund its huge charity works around the globe. Festing suspended Boeselager on Dec. 8 over revelations that the Knights' charity branch Malteser International had distributed thousands of condoms to poor people in Myanmar under his watch. Church teaching forbids artificial contraception. Boeselager has said he stopped the programs when he learned of them. The order's leadership has said the scandal was grave, that Boeselager had hidden the revelations, and called it "disgraceful" that he had refused an order to obey Festing and resign. Boeselager has challenged his ouster with an appeal to the Knights' internal tribunal. Francis appointed a commission to investigate after Boeselager said he had been told by Festing, in Burke's presence, that the Holy See wanted him to resign over the scandal. The Vatican secretary of state has said the pope wanted nothing of the sort and wanted the dispute to be resolved through dialogue. Last week, the Holy See said it expected the order to cooperate with its probe, and in a sharply worded statement said it planned to take action to resolve the dispute. Canon lawyers had raised alarm at the investigation, giving it seemed to set the stage for one sovereign entity intervening in the internal affairs of another. The Holy See, however, has a unique relationship with the order since it is a Catholic entity, and the pope appoints a cardinal to "promote the spiritual interests" of the order and its relationship with the Vatican. 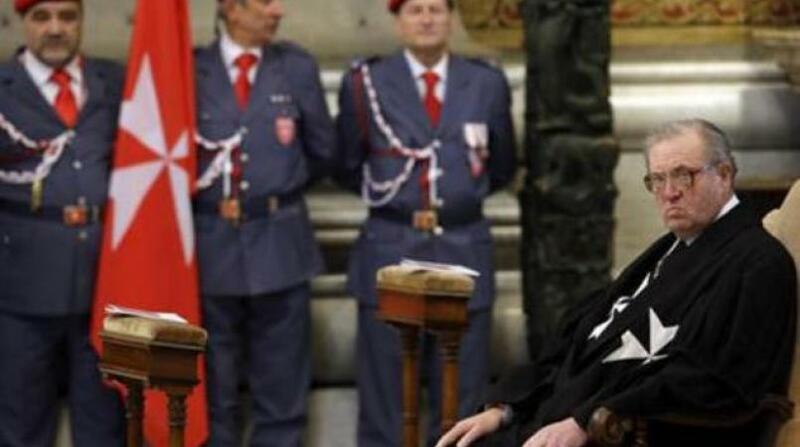 Francis appointed Burke to that position in 2014 after removing him as the Vatican's supreme court justice. The knights trace their history to the 11th-century Crusades with the establishment of an infirmary in Jerusalem that cared for people of all faiths. It now counts 13,500 members and 100,000 staff and volunteers who provide health care in hospitals and clinics around the world. FEATURED IMAGE CAPTION: In this Feb. 9, 2013 file photo, Grand Master of the Knights of Malta Matthew Festing waits for the start of a Mass celebrated by Cardinal Tacisio Bertone, not pictured, to mark the 900th anniversary of the Order of the Knights of Malta, at the Vatican. Festing resigned after entering into a public spat with Pope Francis over the ouster of a top official involved in a condom scandal, a spokeswoman for the ancient lay Catholic order said on Wednesday, January 25, 2017.